The Bug Lady is running a great blog for all of you who like creepy, crawly things. She's invited me to partake of her many photos, and I was more than happy to dig around. I bring to you her Brazilian Wandering Spider. As she discusses in her post regarding Phoneutria Nigriventer, most spiders don't have very toxic venom, they don't inject much in terms of volume, they aren't aggressive (note how most scamper away at any sign of danger), and most have fangs that are too small to propertly pierce the human hide. The Brazilian wandering spider defies all of that. These beasts are large and aggressive, with masssive fangs. Also, they have some of the most toxic venom of all spiders (though it's rarely fatal to humans). When threatened, they go on the attack and bite repeatedly. And since they don't spin webs, they wander...often times into your shoes. Nearly half of all medically significant spider bites in Brazil are attributable to this single speces. So, next time you're in Brazil, take that extra moment to check your shoes and your underpants. It just might save you a trip to the doctors. In Brazil, the neurotoxic action of the venom of spider is very small, although the bite is painful there is no risk of death. 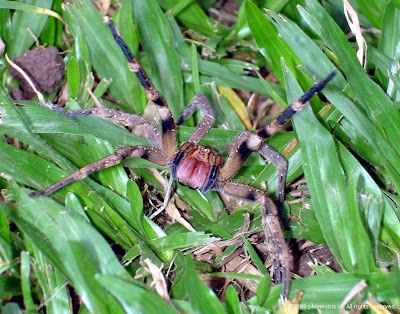 If you come to Brazil beware the spider Loxosceles that is a really petite but makes a much greater damage, causing necrosis in the bite site and may lead the victim to death. Still worth getting to know my country Brazil is sensational. You are right, Silvinha, the Loxosceles is a much more dangerous spider than any of the Phoneutrias, but because of their recluse behavior, they are less likely to bite. The Loxosceles is pretty well known here in the US, they call it the Brown Recluse spider. They are pretty common in barns, and even in urban areas too. And yes, Brazil is worth any possible spider adventures. Awesome spider! And THANK YOU for the link! I'm afraid of spiders as it is. I guess Brazil just adds to one more country I won't be visiting soon. That and Australia. You say there are some of that poisonous spiders in the US as well? .....! Haha Rin, it's not as bad as it sounds. I've only seen maybe 3 wandering spiders in my lifetime, and I lived basically in the jungle. I don't mean to scare you, but yes, the brown recluse and the black widow, which are the other 2 of the America's top 3 can both be found in the US. People say that there is always a spider within 6 feet from you. I don't know if that is true, but if it is, and you can live your life without having any spider incidents, it only goes to show how they really don't want trouble. Does anybody remember that 80's cartoon, "The Sectaurs"? Doesn't it remind you of one of the giant bugs they used to ride in that cartoon?